Thin was in... in the late 1950s and '60's. I'm not sure what was the inspiration for the new trend but in 1957 the first "thin" model called the Thincraft was introduced. A second model called the Thincraft II was also introduced. A Thinline II entered the mix in 1958 and by 1959 eleven Thin-o-matics arrived on the scene. By the mid-1960's the about half of Hamilton's lineup was thin-related. The 1957 Thincraft II was produced for four years - so it was a desirable model. The Thincraft II is unique in a number of ways. It came in both a yellow gold filled case as well as white. It also had a white dial with one pattern of markers or a black dial with a totally different pattern. So there are four different Thincraft II model variations between the case material and the dial colors. Tucked inside the case is an 8/0 sized, 18 jewel 735 movement. This grade is a shock jeweled version of the earlier 748 movement. 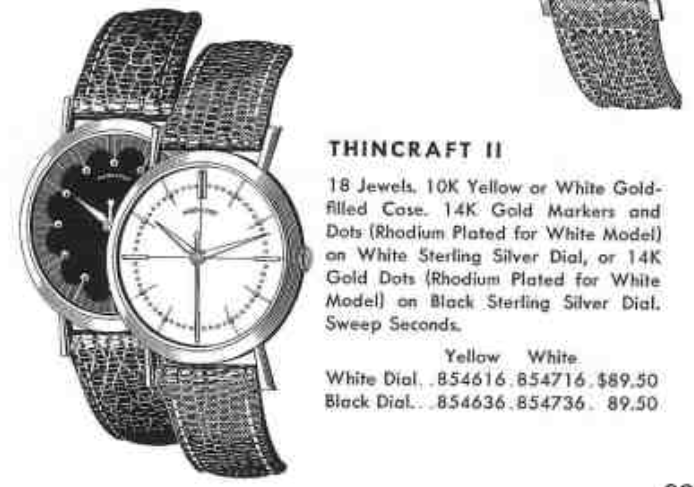 The Thincraft II is not rare but it seems to be a pretty popular model so they tend to sell outside my usual price range for project watches. I've made a run at several but never landed one until recently. The seller's description was very favorable but I've learned to take all that with a grain of salt. Based on the seller's photo, I was expecting to receive the following... looks to be a yellow version with the black dial. Well, when it arrived I was surprised to see that it was a white version. The case was very dirty, and probably turned yellow by nicotine. The second hand is incorrect for the watch and would be more appropriate with solid diamond hands... if there were such things. I usually think a red second hand is a striking addition but this one is just a little too striking for my taste. It's more of a distraction than an attraction. The case back has a yellow-ish tinge to me. That could be because of the lighting in my shop, the nicotine on the case or even a reflection of the orange shirt I was wearing. The seller said the dial was "mint original". In fact they said, "excellent movement condition overall, no oxide; mint original dial; good gilt hands; case shows moderate wear, fine scratches, no dents or dings; crown shows moderate wear; good crystal." I'd have to say that most of that description was optimistic, at best. However, the dial was in decent shape and does appear to be original. The round hour markers really sparkle. The 735 movement looks to be in good shape. It looks like it's been a while since it's had a trip to a watchmaker, though. A new 30.3mm high dome crystal will be a great improvement over the cracked and hazy "good crystal" the seller described. These 8/0 sweep second movements can be very intimidating to work on. Getting the four wheels under the train bridge to line up at the same time is very tricky. It takes a delicate touch and excellent visibility. Although the movement is running with a good beat rate and amplitude, the beat error is a bit high at 5.8ms. Ideally it should be close to zero but I'll usually accept anything under 3 - as adjusting it on a movement like this is risky business. But 5.8 is too high so I'll give it a go. Well, I was able to cut it in half. It's a bit of trial and error and I risk goofing up the balance every time I take it apart to adjust the beat error so I'll call it a day at 2.6ms. I had a spare white (silver) 8/0 second hand so I swapped that out during the reassembly. Now that the case, hands, dial and movement are all clean, this white Thincraft II is really striking. It's a very elegant design, I can see why it was produced for four years. 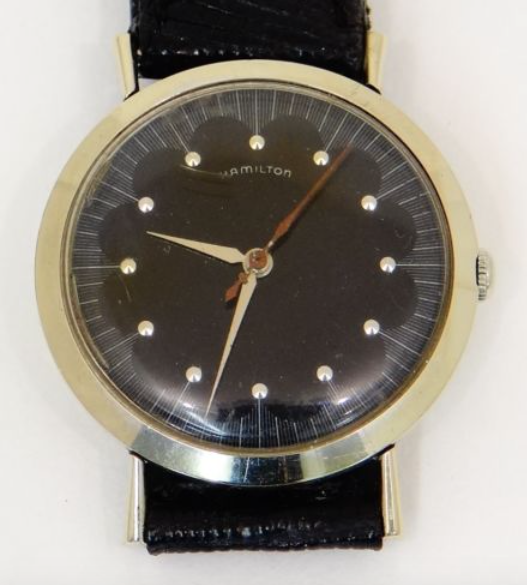 I think following your blog has made take a particular interest in Hamilton wristwatches. I think I will focus my vintage wristwatch collection around Hamiltons.